This summer Just Jack are picking up their sticks and stepping into the festival circuit, bringing all their favourite DJs and the all-important bunting with them. Having kicked started the year with their parties at spiritual home Motion in Bristol with friends Seth Troxler, Maceo Plex, Subb Ann, Laura Jones, Jay Shepheard and Gavin Herlihy, Just Jack now venture onto bigger stages further afield. 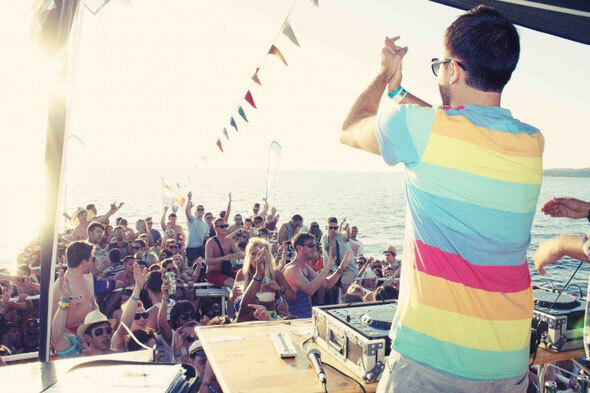 From Bristol to Bulgaria, Bygrave Wood to boats in Croatia, Just Jack will be showcasing their passion for house music and zest for creative and vibrant production that brings an experiential quality to all of these musical milestones. Starting things off in style on home turf, Just Jack host a heavyweight stage at Bristol’s sold out Love Saves The Day festival on Sunday June 3rd. Stepping up to fly the Just Jack flag over Bristol for the bank holiday weekend will be the current leading lights of the electronic music scene Jamie Jones, Maya Jane Coles, Eats Everything, Miguel Campbell, Amirali – live, Huxley, Waifs & Strays alongside residents Dan, Tom and Freddie. Bulgaria’s Meadows in the Mountains see residents Dan Wild and Tom Rio take to the skies on the 8th June to reach the Rhudopian Mountains. Following the unbounded success of their sell-out pirate boat party at Hideout Festival last year, Just Jack return to the sun drenched Croatian island of Pag on the 30th June to set sail again. Revisiting a favourite from last year, Farr Festival on 27th-28th July is the next stop. Set just outside London, Farr is an intimate affair in the middle of a patch of woodland hidden amongst the beautiful fields of the Home Counties. Here Just Jack host their own stage with Rebel Raver jozif, Waifs & Strays, the Bristol duo making waves on Hot Creations, Leftroom and Futureboogie as well as Just Jack residents Dan Wild & Tom Rio. It´s a meeting of souls and minds as West Country meets East London as Just Jack come to Eastern Electrics, who host their debut festival on the 4th August.